Mexico is one of the five countries with greater biological diversity in the planet; Mexican seas, coasts, wetlands, forests, rainforests, savannahs, prairies and deserts, and other environments are home to a vast variety of animal and vegetal organisms, many of them unique. Nevertheless, Mexico is also fifth in the world among the countries with greater rates of annual deforestation. The demographic boom and the overexploitation of natural resources have destroyed complex ecosystems and, as a result, some animals died out. In the case of birds, the destruction of their natural habitat, hunting and illegal trade have put many species in extreme danger of extinction. 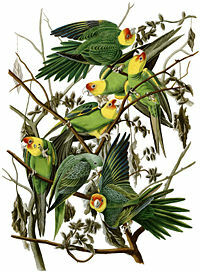 During the past century, many Mexican birds became extinct: the Passenger Pigeon, the Guadalupe Caracara, the Imperial Woodpecker, the Slender Billed Grackle and the Carolina Parakeet (picture). Most of the large birds that live in the tropical rainforests and coasts of Mexico are included in the tragic list of endangered species. This Web site is aimed at the scientific, environmentalist, conservationist communities, as well as civil and government institutions that are striving to preserve the natural wealth of Mexico; but it is specially dedicated to all people helping preserve endangered birds and their ecosystems with small actions every day.